Vin’s house on River Road in Plain, WA has gone through a lot of changes since we first started working for him 5 years ago. In this shot, we have removed a door on the right and installed a window in its’ place, the challenge now is to make it look like there was never a door there to begin with. Here we have framed and insulated the door area and removed the faces of the logs on the left and right side of the opening. Then, we faced the matching logs across the opening and now it appears there was never a door in that area to begin with. Our fasteners are plugged with branch plugs to mimic the look of a wood knot, here you can see the plugged fastener hole, when it is completed, you will not be able to tell where the fasteners went and it looks like a natural area that was not repaired. Our goal is completed. We were also there doing a finish on the new addition to the log home! After cleaning with Lovitt’s cleaner brightener kits and applying 2 coats of Lovitt’s Natural Gold oil based wood finish! Georgeous, but what about the part of the house that was original? Will it match the new addition? In addition to the new addition finish, we restored the original part of the log home to match the new addition! This can only be done by professionally restoring the wood so all the wood looks new to begin with. Our specialty! 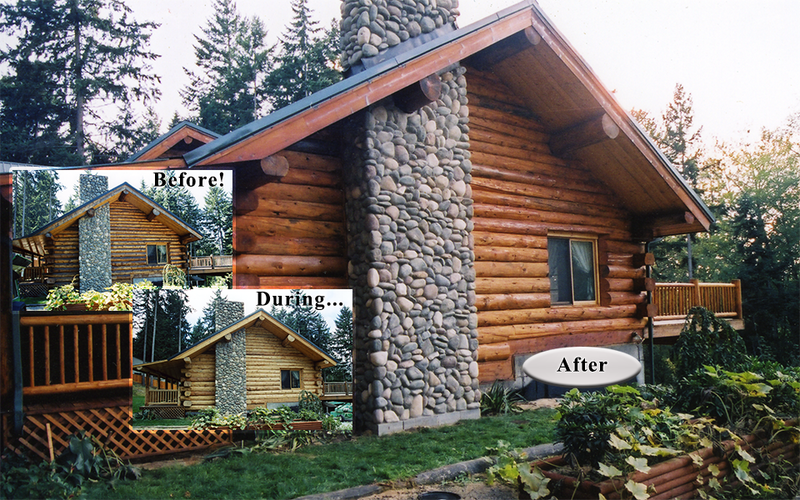 Nobody has the processes we have, our restored log homes stand out way above the average!